In New Mexico, two high schools in the Las Cruces Public Schools (LCPS) district and two in the Gadsden Independent School District (GISD) are using sleep pods — EnergyPods made by MetroNaps. 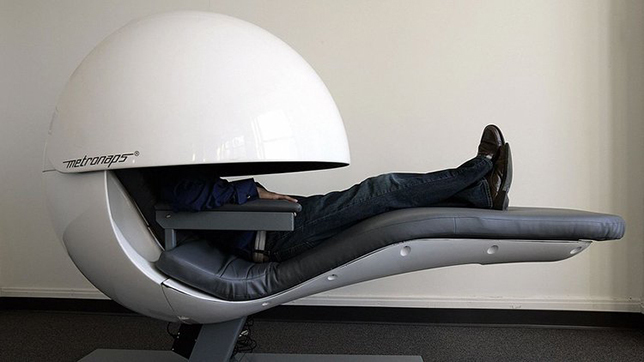 The high-tech pods, consisting of a reclined chair with a domed sensory-reduction bubble that closes around one’s head and torso, were purchased through grants from the New Mexico Community Foundation and the Community Foundation of Southern New Mexico to be used in the school-based health centers, according to the Las Cruces Sun-News. The pods vary a little from school to school. They generally feature a one-touch start button which activates a relaxing sequence of music and soothing lights. Some have headphones for nappers to wear. At the end of 20 minutes, the pod begins to vibrate gently and an up-tempo beat gradually starts playing to wake the student. Currently, LCPS and GISD are the only school districts in the nation using the pods. The first one, purchased in 2008, was installed at Gadsden High School. Linda Summers, an associate professor in the School of Nursing at New Mexico State University, helped secure the grant after discovering the pods —which at the time were being used in a sleep lounge in the basement of the Empire State Building. “Tired New Yorkers would go down there for a short nap in the middle of the day,” she told the Las Cruces Sun-News. The pods have proved better than cots for sleep-deprived students. The National Sleep Foundation recommends 8 to 10 hours of sleep each night for teens to function at their best. However, most teens do not get enough sleep, the NSF reports on its website. One study found that only 15 percent reported sleeping 8.5 hours on school nights, and teens tend to have irregular sleep patterns across the week — they typically stay up late and sleep in late on the weekends, which can affect their biological clocks and harm the quality of their sleep. Summers also discovered that the pods had other benefits. The sleep pods helped all of them. Of 100 students who used it, 99 were able to return to class within 20 minutes — with tremendous increases in energy and mood, Summers said. It even helped calm down agitated students who had been involved in fights, the Sun-News reported. In 2011, Summers secured federal funding for three more pods, which were installed at Chaparral High School, Oñate High School and Las Cruces High School. Daniel Salinas, a senior at Las Cruces High, said he has used the sleep pods about six times. Restworks, the company that distributes the sleep pods, asked Summers if she could help test a less expensive prototype. The “SleepWing” is a device that provides music and vibration while laying on a sofa or cot. The subject wears an eye mask to reduce stimulation and listens through headphones. Summers applied for and received permission to conduct research on the SleepWings, and found that they were just as effective as the more expensive pods. “Some students actually preferred them,” she said. To read more about the sleep pods in New Mexico schools, visit the Las Cruces Sun-News.